Even if it had been the case that Bogaert sought out asexual people for comment and found no one willing to talk (I doubt it), he still misunderstands eating disorders as being about sexual attraction—they aren’t, they’re about control. So yeah, I’d say this kind of discussion really needs both to happen and become visible to professionals, so that they will stop baselessly speculating about how such problems must not exist for ace people. So now, flying in the face of that stunning display of erasure, there is a new blog focused on asexuality and eating disorders! There is an open call for submissions. If you want to contribute something on that topic for the carnival but don’t have a blog yourself (or feel uncomfortable posting it to your own blog), you might consider asking to have it posted there. I would also like to point people interested in this topic to Olivia’s blog, which has quite a lot of good articles on eating disorders, other mental health issues, and asexuality. Previous discussion of the intersection of asexuality and eating disorders here: Sexuality as Selfhood and Body Hatred, I’m Afraid of Identifying as Asexual. And Beautiful Asexuality about body image. If anyone has seen this topic discussed elsewhere, feel free to link things. First of all… since my initial post on this subject apparently read very harshly and negatively to some people, and appeared to be siding with people who think that aces just shouldn’t have any days outside of AAW, let me clarify that that is NOT the case! I’m fully supportive of the event, just confused by it. As I said, that kind of criticism of the event is part of why I was confused. Why make such a big deal out of it? There’s nothing wrong with having a day like that, even if it’s not necessarily appealing to my personal tastes, and even if I’m confused about what’s going on. I held back my criticisms on May 8th and just made jokes specifically because I didn’t want to bring people down—and hoped that at least some people would enjoy the humor. There’s also, as I said before, nothing inherently wrong with seeing an opportunity and being inspired by other successful activism campaigns, although I think there was some issue with the event seeming not distinct enough from, in particular, TDOV—the initial name for it was Ace Day of Visibility, which seemed to be a direct rip-off rather than just something that was inspired by TDOV and that, understandably I think, felt disrespectful to many trans folks. However… I think what the main issue was with the event was that… there wasn’t really a clear goal communicated to everyone. It was sort of made up as it went along, and changed quite a bit due to the controversy surrounding it. Once that drama had actually started happening, everything got even more confusing as things had to be changed, so some of that was unavoidable. Tumblr makes everything confusing by default, because of its horrendously bad design. All conversations hosted there are confusing to me, because I have to keep scrolling up and carefully measuring how the comments are nested in order to even figure out who said what. Besides that, posts tend to get buried and otherwise lost. So with all of that going on, I didn’t even know what day it was going to be until I checked Twitter on that day. When all the information about the event is contained in Tumblr posts, it’s also harder to find, so it’s worth considering having the official information about the event hosted on a page somewhere (else? ), and updated as necessary. Link to wherever the official, up-to-date information is going to be hosted on every post that promotes the event, so that people can easily find out what has changed if they happen to see an older post. Try to be as specific as possible, and if there’s more than one goal, list each one. Also try to present some reasons for why these particular goals are chosen. Please be more specific than just saying “solidarity” or “visibility” because those are very abstract concepts that can be interpreted in many different ways. The more clear your goals are, the less confused people will be. Who is the target participation group, and why? One person suggested that this was meant to be a Tumblr-only event for “getting to know your local community” but if that was the case, why involve Twitter? If it’s multi-platform, try to specify which platforms should be involved, and which are not the main focus. If the event is limited to only certain platforms, let us know why. If your personal ability to advertise on certain platforms is limited, you might consider finding a few other people to co-organize the event with you. They may be able to focus their efforts in places you normally wouldn’t be able to, or reach a wider audience than you could. Where are the most effective places to advertise? Even if only Tumblr was the goal, there was still a failure to let people know what was going on. I would argue that even if the goal is only Tumblr users, it may still be useful to advertise at least on The Asexual Agenda’s weekly linkspam (we need a little bit of advanced notice), since there is a large tumblr following there. They can help spread the word, if you get their attention. If you also want Twitter (or Facebook?) users to get involved (and why not? ), I’d argue that AVEN is still a good place to advertise since many users there also have Twitter accounts—and if you’re uncomfortable posting on the forums yourself, you have only to ask a member there to do it for you. If you can get it onto AVEN’s home page at least a week before the event, a lot of people will see it and spread the word for you. If you email the AVEN team and let them know what’s going on, they’ll be perfectly happy to advertise for you—as they already did on their own. Giving them a little more guidance and advanced warning can only help. AVEN also tends to be the main focus for media requests, so they can potentially put you in contact with journalists, if that’s something that you care about pursuing—and having journalists generate wikipedia-credible articles would help if the goal is to eventually get it on there. Ask around by email to see if people would be interested in advertising for you, because some may agree, or even be interested in organizing a part of the campaign on a social media platform you don’t normally use. (But please only ask each person once and don’t bug them or take offense if they don’t respond.) And, as I said above, strongly consider keeping an up-to-date official page for the event somewhere, so that if things change, people can easily find out what those changes are. How has this campaign broadened in scope from the original intent? Obviously, there was significant activity on Twitter and possibly other social networks. What about Facebook? Instagram? Beyond thinking about just targeted social media sites, what else might have broadened in scope? Will there be additional goals for next year? A way to accommodate those who are uncomfortable categorizing their romantic orientation? What about adding some nods to ace cards from Tarot or other non-traditional playing card decks? Is there a way to expand beyond the card motif? Why was this date chosen, and could other dates be more effective? In my neck of the “woods” May 8th is a day that many college students tend to be busy taking finals, moving out of their dorms, or graduating. They may not even have internet access while they’re on the move. That might be okay in the age of smart phones, though. I personally find the 8th to be a confusing choice, because all ace cards are the first in their suite, and A is the first letter of the alphabet. I think the reason for going with a particular date, especially if it’s counter-intuitive like that, should be communicated well. By the way, May 8th also sometimes falls on Mother’s Day, and it will next year! That makes it a particularly bad choice, I think. There is no possible way that Ace Day could not get drowned out by another holiday next year, if the same date is kept. Is the writing in the official announcement(s) clear? It may be worth running it through a round or two of beta readers who can help you revise before posting. Both The Asexual Agenda and Resources for Ace Survivors does this, and I think those posts/pages that go through this sort of revision process benefit greatly from it. Asking others to read and give feedback helps us catch where our blind spots might be. If you give me enough advanced notice, I can do this kind of thing for you—email me if you want! All of these questions above are applicable to any other kind of activist event or social media campaign. I hope other people considering starting one will also consider them. On a personal note, to Sara… I realize that a lot of the drama and confusion surrounding this event is not something you are personally responsible for, and that this is your first large-scale campaign, and that it’s surely been somewhat under pressure because of Asexual Outreach deadlines. All of this combined with the inevitable trolls is quite a lot to handle at once. Take care of yourself as best you can. And know that I truly do wish you the best in all of your projects, and hope they succeed! And again, I don’t follow things going on at Tumblr very carefully, and the way I use Twitter is generally to go post something, maybe glance at things, and then close the page—or link something from an app without even looking at Twitter itself. I also reply to comments here from mobile pretty frequently, so I can’t always check things out right away, but I will try when I am able. So I’m sure I’ve missed things! If there’s something else relevant to this conversation that anyone would like to link me to, please feel free. I’ve very loosely followed this Ace Day drama from a distance. I don’t get it. So many things about the event—how it was planned, how it was criticized, how it was promoted, why it is even on the 8th instead of the first of some month, and why it apparently had to happen RIGHT NOW instead of say, in three weeks, if there had been so little preparation for it that had been promoted to neither AVEN (as in, on the forums) nor The Asexual Agenda. Why did the ace cards have to represent romantic orientation? Nobody ever sat down and thought about how having to categorize like that would leave a lot of aces out? I wouldn’t have known which suite to pick. It’s even funnier if you know me personally. Moreover, why are we only considering ace cards from the traditional deck of cards? Ace cards in other kinds of decks are beautiful and well worth photographing, too. We don’t need to hold so strictly to tradition, and the incessant focus on categorizing is not helpful. The most significant effect that I noted (from my limited corner of the community, and no, I was not following closely) as a result of Ace Day was that search engine traffic was very high, and many googled “alloromantic” on May 8th. They mostly seemed to flock to Queenie’s article criticizing the divide between alloromantic and aromantic. Knowing that may at least assuage some of the frustration those who felt pressured to categorize their romantic orientation felt, I hope. Today has been brought to you by: confusion about what the word “alloromantic” means. To begin with, I think that while a lot of incorrect and very hurtful things were said about Blackout and TDoV… I think people are correctly perceiving an opportunistic attitude on the part of theasexualityblog. There isn’t necessarily anything wrong with opportunism—or being inspired by other successful activist campaigns—by itself. And Ace Day did accomplish something. A day of pride and love for asexual people is not a bad thing. This type of campaign is not something that appeals to me, but if other people like it? Hey, why not? But the way that it was handled was not ideal. I think a lot more care has to go into planning for next year—and the idea has to be expanded to be inclusive of all aces, not just those who are easy to categorize (and, perhaps, more palatable to the mainstream?). What on earth is getting a page on wikipedia going to accomplish anyway? The event is over. Do it again next year, and the year after that, and build your credibility before demanding to be acknowledged. If you’re expecting wikipedia to somehow give you credibility, then… LOL. Wikipedia is actually being considered less and less credible anyway. The thing is… if you start spamming people with things without first building credibility? They stop listening. The filter learns your name, and you get automatically deleted. Spamming doesn’t work for emails, and it doesn’t work for wikipedia either. And I’m sorry to say it, but doing this sort of thing really makes you come across as unprofessional, and will have an impact on others’ willingness to submit to or invest in your future projects. Building credibility is slow. It takes hard work and a lot of time. If people see you as unwilling to invest that time, if they see you trying to brute force acknowledgement and take credibility… how can we be confident that you won’t try to take those shortcuts in anything else you do? Learn from these mistakes—and acknowledge it so that people know you’re listening. Learn the rules first, and don’t try to make others change their well-established guidelines for you. Next Step Cake has made a guide to getting on wikipedia for you. Ace activists, please take it to heart. Addendum: There was a gap of time between me writing this post and seeing new things that had been posted about this (my posts are frequently scheduled to go up when I won’t be at the computer). I think this one is relevant, and shows a considerably better response. A clarification: The wikipedia article was not planned by theasexualityblog, and was written by someone else. I should have made that more clear in the original post, so I apologize for that. More further reading: I posted some more thoughts on #AceDay with some specific things to consider for next year. Theasexualityblog responded to criticisms that were raised here. I think it’s a good response and addresses how people had been feeling pretty well… although I will note for clarification that Sara seems to have interpreted “opportunistic” as I used it here to mean something far more negative than I meant. “Opportunism” in my view does not necessarily imply exploitation or being motivated by personal gain; it means seeing an opportunity as it arises and going for it. Other critics may have assumed that Ace Day was exploitative of trans people in some way, but I don’t agree. I will also note that tumblr’s absurdly bad format in itself is probably responsible for a lot of the confusion, misinformation, and critics not being well-informed—things will always have to be addressed multiple times if your responses get lost on tumblr, which I think is some degree of inevitable. It’s my hope that linking Sara’s response here will help keep it from being lost to the ages—since WordPress is far more conducive to creating posts with longevity than tumblr. Cross-posted to the The Asexual Agenda. Earlier this month, I wrote about some of the trouble I encountered in creative writing classes here [tw: verbal abuse by teachers, domestic violence mentions]. Consider this post a sort of follow-up to that one. It is also my official submission for the March Carnival of Aces, although I think most of what I wrote about this month is on-topic enough to include even though it wasn’t specifically for the carnival. Last time, my focus was on trouble with teachers, and how as a survivor (and secondarily, as an ace) sometimes creative writing classes are especially difficult. This time, I want to focus on reception of different types of work about asexuality specifically, and mostly from peers rather than teachers. Asexual Bingo card created by the author. Click for a flier with information about her book! I’ve been waiting for this book for a long time. Years before it was written, I remember reading a conversation on LJ in which the author, Julie Sondra Decker (also known as swankivy), talked about potentially writing a book like this. Then, when it finally came out, my copy got lost in the mail! It took months for me to get the situation sorted out and actually receive a copy, although part of that was that I was out of town and without internet access for a significant part of last fall. But it’s finally here, and now that I’ve read it twice, I can say with complete confidence: it’s excellent! Before we continue, please note: Although I’ve been part of the ace community for a long time, and spent a bit of that time talking to the author several years ago, I was not in any way involved with the creation of this book. I didn’t provide any quotes, nor did I do any beta-reading. Because I took a long hiatus from the community starting in 2012, I didn’t even know that it was finally being written until after a release date had been announced! So when I read this, I came into it with, perhaps, fewer expectations for exactly what was going to make it into the book than those who contributed to it… and also more criticisms, because one can generally expect most of the contributors’ criticisms to have been addressed before release. What/Who is this book for? Fair enough! So I’m judging this based on those stated goals. This isn’t supposed to be the be-all and end-all of any writing on asexuality—it’s just a beginning. And does it succeed at being a good beginning? Yes! First, let’s talk about the best parts. The writing is clear, concise, and casual. It’s easy to follow for a layperson, so it definitely achieves the right level of accessibility for its intended audience—and, crucially, it does so without feeling like it’s talking down to anyone. It has a great hook for anyone starting the book right from the beginning. The author’s personal experiences and history of involvement with the community (pre-dating the establishment of AVEN) contextualize the book, and quickly dispel any notions that asexuality is “what the kids on Tumblr are making up these days” without having to directly address that charge. I particularly appreciate the acknowledgment that she’s been fairly lucky in terms of having “supportive family, unshakable confidence, no serious problems or issues in [her] life, and a thick skin,” because it’s important for readers to know that others haven’t been so lucky. The structure of the book is very well thought out. It is divided into five parts: 1) Asexuality 101, 2) Asexual Experiences, 3) The Many Myths of Asexuality, 4) If You’re Asexual (Or Think You Might Be), and 5) If Someone You Know is Asexual (Or Might Be). This allows a person searching for specific information to pick up the book and flip to the most relevant section. The author also makes very good use of headers, sub-headers, lists, and bold text so that skimming readers will still pick up on the most important points. I love the quotes from other community members highlighted in gray boxes throughout the book. They tie in others’ experiences, clarify concepts, provide illustrations of things described in the main text, visually break things up so that the reader will tend to feel less overwhelmed by walls of text, and serve as extra hooks to draw readers (back) in. My personal favorite highlighted quote is at the top of page 38: It’s an anonymous person’s illustration of their experience with grayness through the metaphor of soda vs. water vs. water-with-a-bit-of-soda-in-it. I think that’s a brilliant analogy to explain experiences of graysexuality not defined by rarity, and I think it will be clarifying for a lot of people. It resists the most common way of explaining grayness, and I think that’s exactly the sort of thing that’s needed in visibility efforts to allow others to really understand these concepts. Many points are supported by footnotes leading to more information, with a great bibliography in the back so that readers can look up the relevant studies for themselves. There is also a large list of other resources in the back—although books can’t keep up with the constant change of the internet, so a few of them have already disappeared. If you’re a writer, all of the above are great lessons. 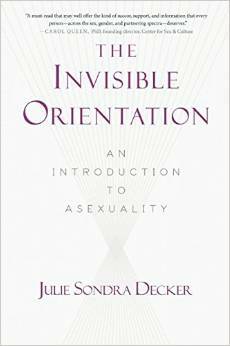 I also appreciate the minimalist cover, because it really mirrors how minimized and, indeed, invisible asexuality tends to be. Technically, that’s not part of the writing, and probably not something the author could control. Many people will tell you “don’t judge a book by its cover.” But I think that people also tend to greatly underestimate how important packaging really is in whether or not a book will sell. And considering that this is supposed to intrigue people enough to introduce them to asexuality for the first time and legitimize the orientation in their minds, in this case a professional look is especially important. Now, I was all set to rate this five stars… but upon rereading the first half of the book and counting up the places where there are serious issues, I have to take it down to four. These are issues that (mostly) seemed very minor to me… until I really started thinking about the implications of them. I summarized these in my Goodreads review, but here I will fully explain them.